For better or worse, Jem and the Holograms will be back in your life again soon with a live-action movie hitting theaters in October. Though it only ran for three seasons, Jem had quite the cult following. Relive her glory days with these 13 facts about the fictional rocker. 1. 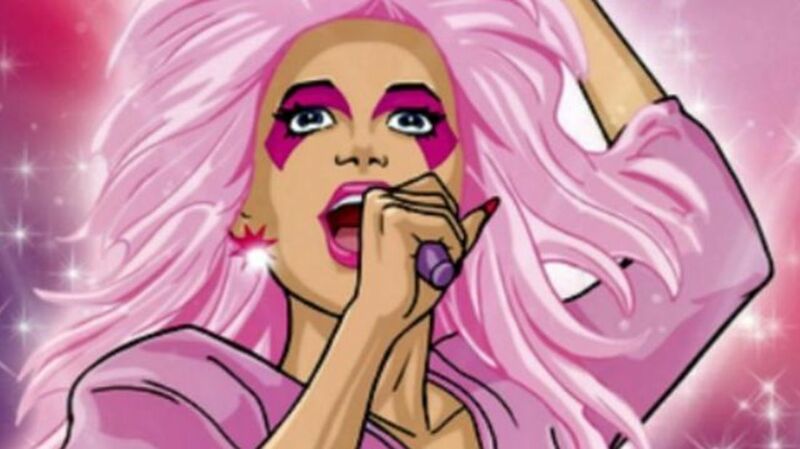 The actress who provided Jem’s singing voice had never sung professionally. Jem was actress Britta Phillips’ first professional gig. For her audition, she sang the show’s theme song—not only did she nail the audition, but producers liked this version so much they kept it as the one that was actually used in production. 2. But Jem’s speaking voice was provided by a professional singer. 3. Jem was a doll before she was a cartoon. Hasbro had already created a couple of cartoon shows to market their toys—G.I. Joe and Transformers. Hoping to strike gold again with a female audience, the company created a doll they hoped would give Barbie a run for her money. They recruited Sunbow Productions, the studio behind the G.I. Joe show, who gave it to writer Christy Marx, because “they liked my work, plus I was about the only woman writer they had." 4. The Holograms’ last names were inspired by scientists. Pizzazz Gabor from the Misfits was named after Dennis Gabor, who won the Nobel Prize in Physics for inventing holography. Villain Eric Raymond was named after Marx’s brother, who, incidentally, had nothing to do with the development of holograms. Fans' love for Jem hasn’t waned in the years since the show went off the air. Devoted viewers celebrate Jem and her outrageousness at the annual JemCon, which includes guest panels, vendors, entertainment, karaoke opportunities—and, of course, lots of cosplay. 6. There were some famous singers behind the other bands. 7. Jem originally had a different name. Before she was Jem, she was simply “M,” which stood for music, metamorphosis, and magic. Instead of having an alter ego named Jerrica, M’s was named Misty. There are a number of reasons cited for why “M” didn’t stick, all involving copyright. Mattel might have complained because people would think an “M” doll was their creation; “M” might have run into copyright problems with “MTV;” and Hasbro was afraid Bette Midler would sue them since she was known as the Divine Miss M.
8. Barbie and the Rockers definitely weren't a response to Jem’s popularity … according to Mattel. 9. Despite the success of the show, the Jem doll didn’t actually sell well. Turns out Mattel didn’t have much to worry about. While the dolls were a huge success their first year, sales quickly dropped off. It’s speculated that one of the contributing factors was purely logistical: The box was poorly designed. The shelves in doll aisles in virtually all retail stores were designed to hold the 11-3/4” Barbie boxes—and Jem’s 14-1/2” packaging was way too large. To reconfigure shelving would have meant lost shelf space for retail stores, so instead, Jem and her buddies weren’t displayed as Hasbro intended. Thinking they could still appeal to the Jem market, Hasbro later released a similar doll called “Maxie” who was nearly the same size as Barbie. They even tried creating a cartoon series for her called Maxie’s World, but it was canceled after just 32 episodes. 12. Song lyrics were usually credited to “Kimber” and “Stormer,” but they were actually written by a veteran theater and TV songwriter. But Barry Harman doesn’t have any hard feelings: “My job was to create songs that the audience would believe the characters had written. If people actually believed Kimber and Stormer wrote the songs, then we did a good job,” he has said. Harman has a lot of Jem lyrics under his belt—180 songs, to be exact, although several of them were never released. 13. Marx has just one Jem doll. According to Marx, the only Jem doll she ever received was one her mother bought her.